Earlier this week, I arrived back in the States after a two-week stay in Peru. Since then I have been trying to put into words the joys and heartbreak that came along with the journey. Before I left the States, I knew the trip would open my eyes to a way of life much different than my own. I have traveled to many places and experienced much sorrow, but what I experienced in La Florida, Peru, has motivated me to do something. Whether that something is spreading the word of the community needs, sharing the stories of the families or raising money for home sponsorship, my mission will not end until every family has a place to call home. Until then, the tug and longing La Florida has on my heart will drive me to bring about God’s desire to provide for the basic needs of everyone. Even with all the stories I’ve come back with, I could not move your heart the way seeing and experiences for yourself would. The only way to truly experience this is to see the sorrow in the mother’s eyes when she cannot provide for the basic needs of her children or the smile of the little child with worn-out clothes and shoes too small for their feet smile from ear to ear because they are going to have a house! A beautiful house made of bricks! For many of these families, owning a home with solid walls never even crossed their minds as possible. They have spent their whole lives living among the dirt and sticks, which are pressed together to form four walls and, sometimes, a roof. They gather together whatever they can to provide a soft and warm place to sleep at night, but for many this is not much. When The Fuller Center for Housing first went into La Florida four years ago, it was like a ghost town. The lush valley of crops with dirt mountains in the distance, seems to extend forever. This is until you get to La Florida. At the entrance of the town, the green fields of crops turns into brown dirt-filled streets and homes made of sticks. It seemed like life had drawn a line and stopped. The people knew life outside La Florida was different, but they never dreamed La Florida could someday be that something different. Now, four years later, the town has tripled in size. More than 500 small trees have been planted around town, electricity has expended to many more families and 28 families now have a beautiful brick house to call home. During my stay in La Florida, the local government passed a bill to install clean water and sewage into each home starting in April. This progress shows just how far the town has come. However, we cannot stop there because hundreds of families still live in poor conditions and need a helping hand. This Sept. 1-8, The Fuller Center for Housing plans to offer just that. 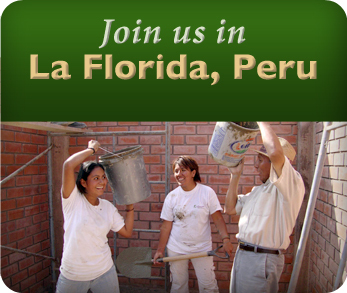 During this one week, people like you and I will gather together in La Florida, Peru, for the international hub of the 2012 Millard Fuller Legacy Build. 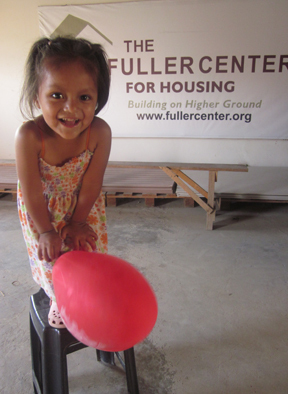 This week will celebrate and honor the life and work of Millard Fuller, as well as the hopes and dreams of La Florida. At the end of the week, 2,500 trees will be planted and 10 families will be given the keys to their brand new homes. I had the chance to meet each one of these deserving families, and I cannot wait to see them walk into their new homes in September. The transformation from sticks to bricks will be incredible. However, in order for this to happen, people like you need to accept the tug at your heart and allow God to use you. Whether God wants to use you by praying for the families and work teams, sponsoring a home or joining the trip this September, accepting and honoring the call is what I am asking of you. So join me and do something! 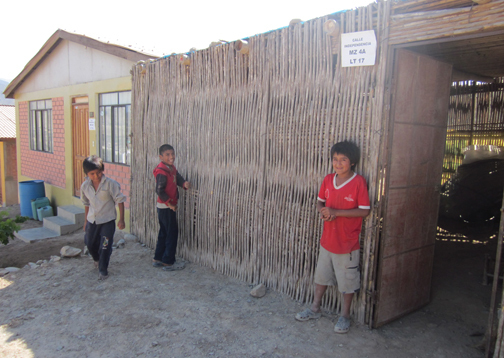 of the 2012 Millard Fuller Legacy Build in Peru! It sounds like you had a great experience Hailey. And the September build in Peru sounds realy exciting. I wish you all the best with the planning, recruiting and executing in the days ahead. Let me know if I can help you out in any way.